Easter Day 2019 – The Resurrection Of Jesus: He Is Risen! Listen to Rev Trevor Golding on Easter morning celebrating the day of Jesus' Resurrection! He Is Risen! Listen to the Good Friday sermon by Rev Trevor Golding for Easter 2019, as he walks us through this important moment in Jesus' life. On the 6th Sunday of Lent, Palm Sunday, Rev Trevor Golding takes us for a wander around the church to help talk us through Bible verses 28-40 from Luke 6, which talks about Jesus riding into Jerusalem as a king! This podcast also features the latest church notices, reflection and prayer from the ministry team too. 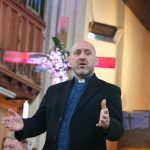 On the 5th Sunday of Lent, Passion Sunday, Rev Ian Daniels takes us through Bible verses 37-42 from Luke 6, which talks about how we treat and judge others. On the 4th Sunday of Lent, Mothering Sunday, Rev Trevor Golding takes us through Bible verses 46-49 from Luke 6, and the story of the 'Wise and Foolish Builders'. Rev Trevor Goulding leads us on the second Sunday of Lent as we explore 'Blessings and Woes' from Luke 6, where Jesus once again addresses and teaches his disciples. Rev Trevor Goulding leads us on the first Sunday of Lent as we explore 'The Temptation Of Jesus', where Jesus, full of the Holy Spirit, left the Jordan and was led by the Spirit into the wilderness, where for forty days he was tempted by the devil. This sermon on 'Being Called To Lead' was taken from our 10:30 service on March 03rd 2019. For more great teaching from St. Augustine's Church in Ipswich, check out the Talks page on the website, or why not join us every Sunday morning from 10:30? You'll be warmly welcomed and accepted where ever you might be on your walk with God. This audio was taken from our 10:30 service on Feb 24th 2019. For more great teaching from St. Augustine's Church in Ipswich, check out the Talks page on the website, or why not join us every Sunday morning from 10:30? You'll be warmly welcomed and accepted where ever you might be on your walk with God.